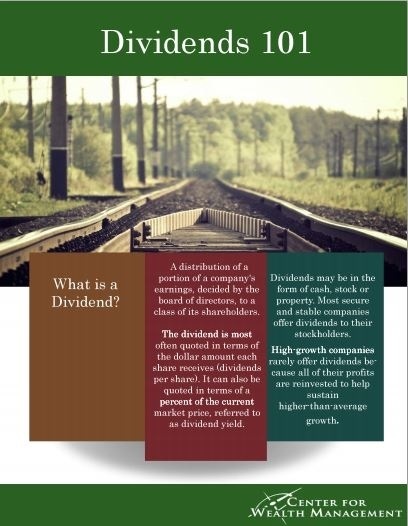 Dividends are a distribution of a portion of a company's earnings to a certain class of its shareholders. The amount is decided upon by the board of directors and is most often quoted in terms of the dollar amount each share receives. It can also be quoted in terms of a percent of the current market price, referred to as dividend yield. Dividends may be in the form of cash, stock or property. Most secure and stable companies offer them to their stockholders. High-growth companies rarely offer dividends because all of their profits are reinvested to help sustain higher-than-average growth. Companies that pay a dividend are generally companies that have stable cash flows and strong balance sheets. Most growth companies do not pay them. Companies that pay a dividend are taking cash off of their books and putting the money onto yours. The dividends can be reinvested back into the company who paid the dividend or could be paid to you in cash for your discretionary use. Living off of your dividend income is possible if your expenses are below the income coming in. It is not recommended to only have one stock for this. A diversified portfolio of stocks is more prudent. It is possible that the board of directors of a company could reduce, or even eliminate, the paying of a dividend. This is a big reason to not have all of your eggs in one basket. Focus on companies that have a long track record of paying and increasing their dividend pay-out. Do not chase companies that offer a very high dividend yield. Often times this a disaster waiting to happen. Reinvesting dividends has been a proven way to grow your assets through compound interest. Investing in dividend stocks is not a guarantee of investment results nor is it a guarantee that a company is good or not. Click here to find out more about Dividends or call us at (513) 407-5430.